No, he’s not the hard-hitting captain that has been disrupting teams during the playoffs. No, he’s not the young American goalie leading the league in GAA and save percentage. And no, he’s not even that power forward that is always related to pancake jokes. His name is Anze Kopitar, and if you haven’t noticed the Los Angeles Kings in the past five or six years, you’ve been missing out on a great talent in hockey. Now on the NHL’s center stage in the Stanley Cup Finals, Kopitar has thrust himself into the spotlight with a beautiful game-winning goal in overtime, demonstrating his stickhandling ability, poise, patience, and overall skill. There are some basics to learn about Kopitar that many people (including the LA media) have not mastered. 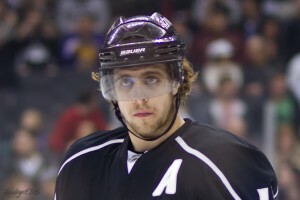 Kopitar was drafted 11th overall in the 2005 NHL Entry Draft by the Kings. 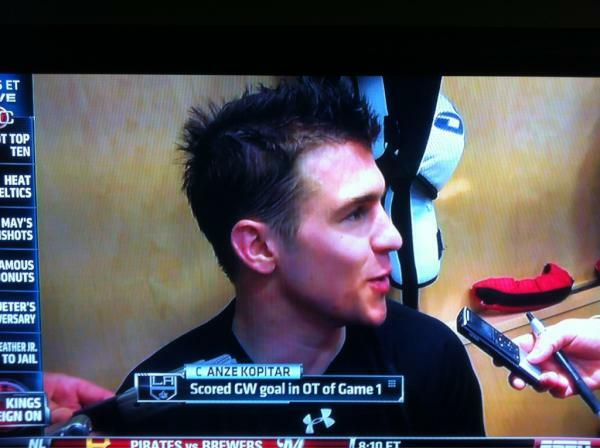 He is the first Slovenian to ever play in the NHL. Most importantly, his name is pronounced as “AHN-Jay KOE-pih-tar” according to a majority of sources online, including the Kings website. Here is an audio link for those who want to master it (I’m looking at you, LA media). Kopitar made his NHL debut on October 6, 2006 and was simply dazzlingly as he scored two goals against the Anaheim Ducks. The NHL recognized his talent and placed him in the YoungStars Game at the All-Star break, where he scored 5 points. He finished the season with 61 points in 72 games. This would be the only season of his career where he did not lead the Kings in points, as he was beat out by Mike Cammalleri and Alexander Frolov. In his second season, ’07-‘08, Kopitar led the Kings with 77 points as he played in all 82 games and was the youngest player named to the All-Star game. He would continue to play in every game until suffering an ankle injury late in the ’10-’11 season, which occurred after he set a new Kings record for consecutive games played at 330. Over his career, Kopitar has produced 434 points in 475 regular season games and now has 21 points in 21 playoff games. He has been named to a YoungStars game and has made two All-Star appearances (2008 and 2011). He has led the Kings in scoring for the past five seasons. He plays on the powerplay and the penalty kill, and is trustworthy in any game situation. Finally, he is a European player that interviews incredibly well as he speaks flawless English (demonstrated by the interview after his GWG). The hockey world is long overdue for their introduction to this underappreciated star who has somehow hidden himself in Los Angeles. Darren Pang even went on record on NHL Tonight after Game 1 to say, “he’s my guy to win the Conn Smythe trophy”. So take a break from Jonathan Quick, Ilya Kovalchuk, Zach Parise, and Dustin Brown for a moment and enjoy all that is Anze Kopitar. Maybe if you do that, it will make up for some media outlets that don’t consider a Stanley Cup Finals overtime goal important enough to caption names properly….